Shane Shirley : What I am Loving Right Now for Green Holiday Gift Giving - All Natural, Non-Toxic, Aromatherapy Candles Sustainably Made from Beeswax...at Wholesale Pricing! What I am Loving Right Now for Green Holiday Gift Giving - All Natural, Non-Toxic, Aromatherapy Candles Sustainably Made from Beeswax...at Wholesale Pricing! - Set of Beehive Glass and Two (2) Refill candles, shown above beautifully packaged and ready to give! - Candle Refills - Single Six (6) ounce (4.2 oz. by weight) candle - burns for over 35 hours. I have been looking through all of my green living partner sites to prepare a Green Holiday Gift Guide but I came across a most awesome green gift giving idea that I just cannot wait to tell you about. Since I have been trying to live more sustainably and have fewer chemical scents in my home (due to my daughters' asthma), I have fallen in love with beeswax candles and I have discovered that Big Dipper Wax Works has the best all natural, non-toxic and non-allergenic, beeswax candles that burn clean and soot free for what seems like forever. I like that beeswax is the purest of all waxes, is a product of the sustainable beekeeping industry and is paraffin free; paraffin is a petroleum based product that most candles are made of. 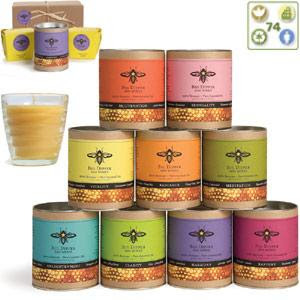 I have become a big fan of Big Dipper Wax Works' therapeutic aromatherapy candles and today I found these special candles boxed and ready to give in an adorable beehive, glass votive! The price is right too. You must check them out and pick some up in just the right scent for your mom, sisters, friends, teachers, coaches and anyone else who could use a little aromatherapy in their life! Green Holiday Gift Guide is useful for its scent candles which is much more useful for aromatherapy.Thia gift pack contains large amount of products that will be beneficial for anyone.Thanks for sharing the post.